Photographs by Luigi Ghirri. Text by Germano Celant. Preface by William Eggleston. Notes by Paola Ghirri. Designed by Yolanda Cuomo. Aperture, New York, USA, 2018. 152 pp., 95 color and 30 b&w illustrations, 11x8½". 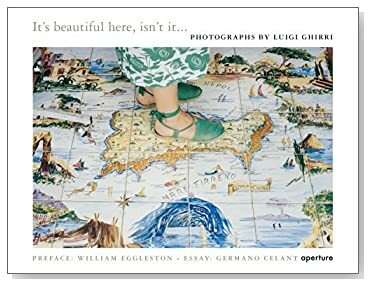 Luigi Ghirri, an extraordinary photographer and writer with a rich and varied career, is well-known in his native Italy, but not yet familiar to an international audience, perhaps because he died so young. It's Beautiful Here, Isn't It—the first book published on Ghirri in the U.S.—will establish him as the seminal artist he was. Ghirri shared the sensibility of what became known as the New Color and the New Topographics movements before they had been named. Like his counterparts in Italian cinema, Ghirri believed the local and the universal were inseparable, and that life's polarities—love and hate, present and past—were equally compelling. He worked in Giorgio Morandi's studio and with architect Aldo Rossi, while influencing a generation of photographers, including Olivo Barbieri and Martin Parr. This dynamic book includes a selection of Ghirri's essays, published in English for the first time, and a selected chronology. This project was made possible, in part, through the generosity of Istituto Italiano di Cultura. Additional support was provided by Joseph T. Baio, Sondra Gilman and Celso Gonzalez-Falla, Lynne and Harold Honickman, and Mercedes Menocal Gregoire.